The guns, ammunition, spent shells and marijuana that were seized from several locations across Guyana. 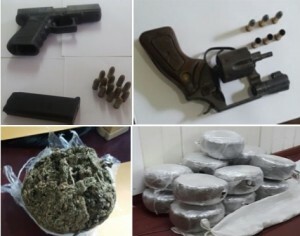 Five persons have been arrested in connection with the seizure of two handguns, 46 live rounds, numerous spent shells and more than 24 kilogrammes of marijuana within 24 hours at several locations countrywide. A 41 year old driver of Palmyra, Berbice, was early Saturday morning arrested with an unlicensed handgun and 13 rounds of ammunition. Investigators said an alert police patrol spotted the suspect who was driving his motor car on the Palmyra Public Road, about 1:30 AM. The suspect upon seeing the patrol attempted to speed away but was intercepted and searched, during which the 9mm pistol and ammunition were found on his person. Fifteen minutes later at about 1:45 AM, policemen said they acted on information and searched a shop at Black Water Backdam, Konawaruk River where they found an unlicensed .32 revolver with three matching rounds and three spent shells. A 56 year old male businessman of Diamond Housing Scheme, East Bank Demerara who claimed ownership, is in custody. in possession of a man in Linden. About 6:30 Friday evening, an alert member of the Rural Constabulary observed a 32 year old, unemployed, male from Bartica, in the Community of Wismar, Linden, with several bags acting in a suspicious manner. A search was conducted on the suspect and six empty cartridges/casings, 31 spent .32 and 9 mm shells and 21 live .32 and 9mm rounds were allegedly found in his possession. In relation to the marijuana seizures, investigators said about 11:30 Friday night a 69 years old, businessman, of South Turkeyen, East Coast Demerara was arrested at his place of business, after 410 grams of cannabis were found in his premises. Police ranks acting on information went to the suspect’s shop at Takuba Lodge Backdam, Konawaruk River, and conducted a search, when the illegal substance was found. And, a 60 year old male of Prashad Nagar was early Saturday morning taken into custody, after in excess of 52 pounds of compressed cannabis was found in his house. Ranks of the Guyana Police Force acting on information received went to the suspect’s house and conducted a search, during which 13 taped parcels of the illegal substance with a weight of 24 kilogrammes were found.